The 4' foot Yorkshire window planter box combines good looks and low maintenance. 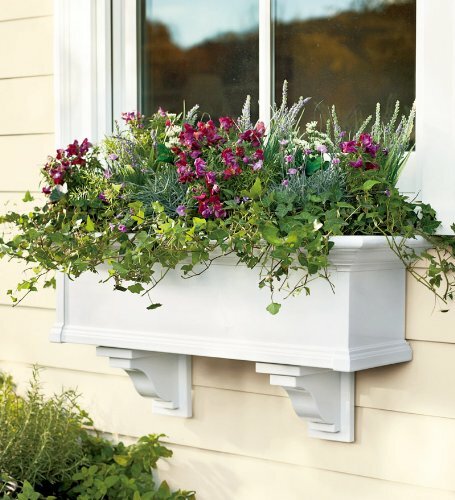 Complement the appearance of your home with a window box that won't warp or rust and never needs painting. Easy care PVC cleans up with the simple rinse of a garden hose. A sub-irrigation water system encourages root growth even if you forget to water. Before assembly, can also be cut to fit a custom size window. Two standard wall-mount brackets included. Assembly required. Size: 10"D x 12"H x 4"L. Color: White.